Ladybug (known as Ladybird in the British English version) is the first microgame the player makes in WarioWare: D.I.Y. in the D.I.Y. 101 section of the game. Penny and Wario teach the player the fundamentals of making a microgame with this game first. The player has to tap the ladybug with a stylus to make it move, resulting in a win. 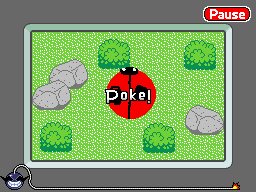 If the player fails to tap the ladybug, they fail. Step 1: How do you make games? Penny explains the foundation of microgames: first comes the background, then the objects, then the music, and finally the AI (Action Instructions). Step 2: Drawing the background! Penny teaches the player how to make the background. In Ladybug, the background consists of grass, rocks, and shrubs. The player is taught how to use pre-made palettes and stamps to accomplish this. Step 3: Drawing an object! The player is taught how to draw objects and their cels, creating art. The player is taught how to make music and create notes. Step 5: Getting that bug moving! Penny teaches the player how to assign AI to the ladybug to make it so that when tapped, it will move. Step 6: Winning the game! The player learns how to set win conditions for their games. This page was last edited on October 22, 2018, at 18:27.